The 2018 Buick Enclave comes fully equipped with intelligent all-wheel drive. 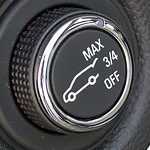 This means that they can automatically deliver optimal performance and traction on the wheels when the road conditions are not what they should be. The five-link rear suspension is definitely innovative, no question about that. First of all, this suspension can help ensure a smooth ride and great handling because it has responsive steering and improved cornering options. Couple this with reduced noise and vibration and you have a rear suspension that definitely makes this an easy car to drive. Do these features sound appealing to you? If so, contact Tulley Automotive Group today and we would be happy to arrange for you to have a no-pressure test drive!